Please find below a list of the major new improvements and bug fixes in the AODocs Smartbar version 4.3. Important news: In order to provide the best experience and an even more secured extension, the Smartbar 4.3 only works with Google Chrome version 49 and higher. Clicking on the AODocs document title redirects the user to the AODocs document in the AODocs interface. 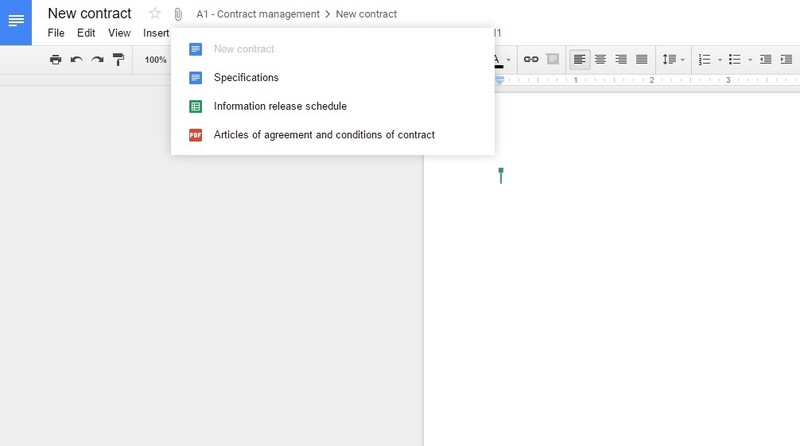 Clicking on the button opens the document information card, which displays the document’s metadata and workflow status. In the card, the document title links to the parent AODocs document. When some actions displayed in the “NEW” menu are not available to the user, they are now displayed in a grey font to indicate that they are disabled. 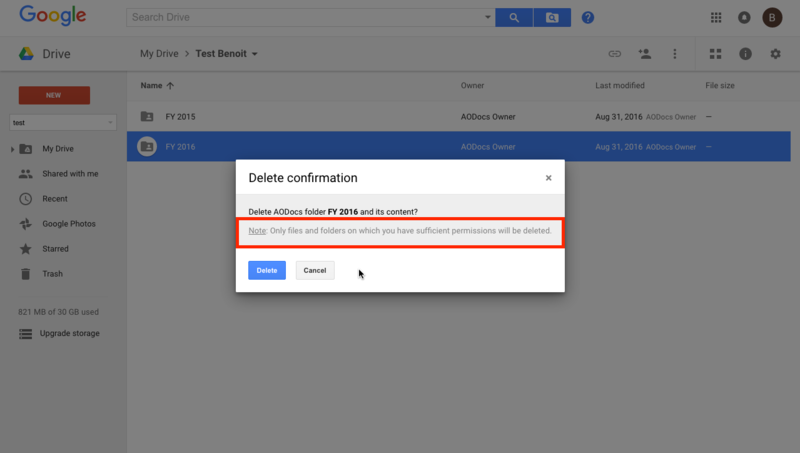 For example, if the parameter "only admin can modify the folder structure" is activated, the “Upload Folder” button is now grayed for users who have only contributor permissions. For users who have read only access on a folder, all the creation options are hidden in this folder. The confirmation dialogs displayed by the Smartbar (for example, the popup asking a user to confirm the removal of a folder) now display more detailed information on what is going to happen when the operation is confirmed. If a user tries to edit a Microsoft Office file that is being edited by another user, the AODocs Smartbar now displays a clear error message. When working on a Google Doc / Sheet / Slide attached to an AODocs Document Management library, the Smartbar will soon display the list of other Google Drive files attached to the same AODocs parent document. 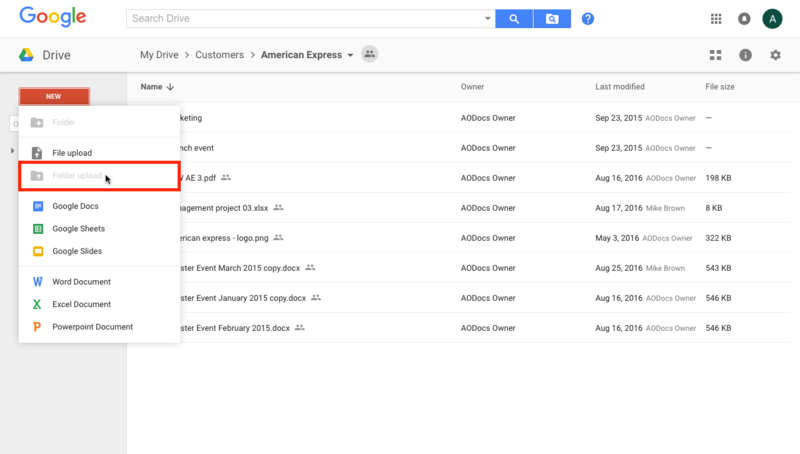 How can we improve your Google Drive experience? In order for us to get feedback on which features you would like to see in the future, please access the following forum AODocs in Google Drive (Smartbar) Feature requests. On this forum, you can vote for improvements proposed by other users, comment on posts and make your own feature suggestions. The current list is based on the requests we received through the support, sales and projects teams.